Renovating our new studio & shop! Can we have some?? please!! please!!! I went on a picnic with my friends and our doggies. One of my friends has a toy poodle named Noel,3 year old male. He is fun-loving,happy all the time! His personality is totally opposite to my dog Wato.When Noel was like " Come on over and play! " Wato patiently ignored him.But Noel kept mounting Wato many times, then Wato showed his teeth and snarled.We were so surprised! We have never seen him behave like that.. They can be good friends,for sure! I 'm not an "outdoorswoman" but look at that his cute sleeping face after he played! 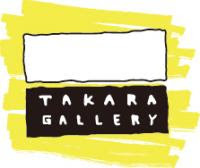 Takara Galleryのイベント " Workroom vol.1 "
We did the screen printing workshop on 3rd - 5th May in Gujo hachiman. 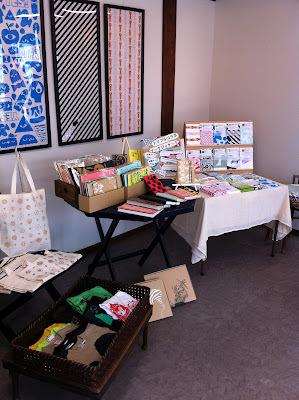 The event called "Workroom vol.1 "
You could make your own Tenugui by screen printing. We rented " Gallery NAOI " located the popular tourist site "Gujo hachiman"
So a lot of tourists and friends were enjoyed our workshop! we 'll do the same workshop on this July! 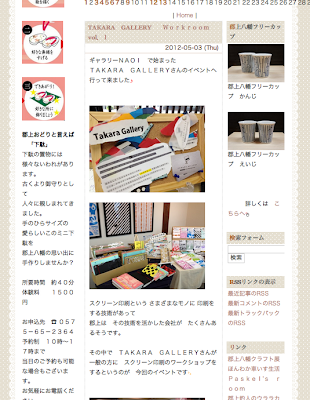 We moved 'Takara Gallery's Blog' here! My most recent news is.... I ADOPTED A DOGGY! His name is Watson, a Chinese Crested Dog, hairless, 2 years old. (Dishonest breeders threw him away then animal protection group rescued him. )He is very clever and well-tempered and calm. He is a little bit of a scatterbrain and he is very very easy to scare. Whenever I invite some people into my house or take him to a friends house ,wato(we call him Wato. very japanese,eh? ) huddled under the table or on my lap, patiently waiting for people to leave. He loves going for walks! I'm living in the county side at the mo. dogs loves the country side, I 'm certain he does too!